awarded 5 Gold Stars by Visit Scotland. 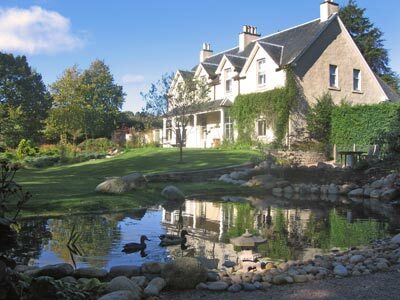 Affordable Five Gold Star bed and breakfast on the edge of a small highland town. Also awarded the AA Breakfast Award. The Dulaig is on the edge of the small Highland town of Grantown-on-Spey hidden away about 400 yards from the wide avenue high street where you can find everything from a good outdoor clothes shop to pubs, restaurants and cafés. It's a good base for exploring Speyside whisky distilleries, castles, and touring, climbing and walking in the Cairngorms. The Spey is one of Scotland's most beautiful rivers and the town is on its gently sloping north bank. You can easily walk from The Dulaig down through ancient Anagach wood under Scots Pines with an underfloor of blaeberries to the water's edge. Birch and pine forests cover the hills to the Cairngorm mountains. 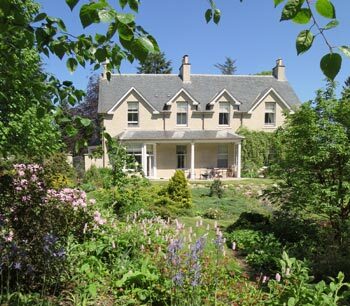 Rightly awarded 5 stars by the Scottish Tourist Board, Carol and Gordon Bulloch's home is surely one of the most welcoming, comfortable and rewarding places to stay in this part of Scotland. 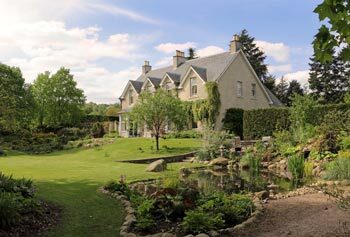 With an easy-going charm, Carol and Gordon's collection of fine Arts and Crafts furniture and objects are exactly appropriate for the 1910 date of the house, and with amazingly luxurious bedrooms and bathrooms, views over the garden (Red Squirrels!) 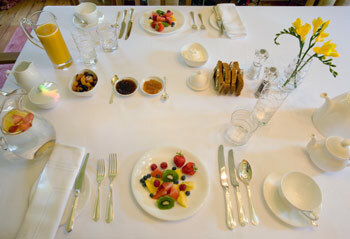 and spectacular breakfasts, everyone enjoys staying here. 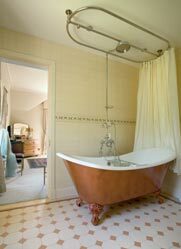 All three bedrooms look onto the garden and have luxury Vi-Spring mattresses with fine linens, satellite TV, DVD, silent mini fridge, tea and coffee making facilities, hairdryer, fluffy towels and bathrobes, and luxury toiletries. 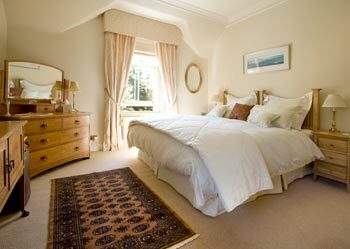 Above; Shapland Double or Twin bedroom. 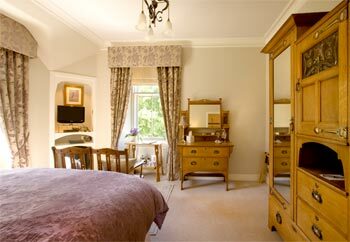 Named after Shapland and Petter makers of the fine Arts and Crafts wardrobe and dressing table you can see in the photograph. 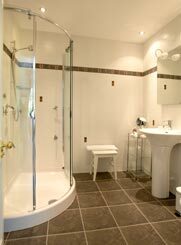 Shower-room (shower, basin and wc) with underfloor heating, en suite. Above; Benson bedroom. Named after the copper and brass lamp made by W.A.S. Benson, (1854-1924) who spanned the transition between the Arts and Crafts Movement and Art Nouveau. Bathroom with whirlpool bath with shower over, basin and wc, en suite. Above; Taylor Double or Twin bedroom. Named after the elegant EA Taylor oak wardrobe with pewter and marquetry inlays. 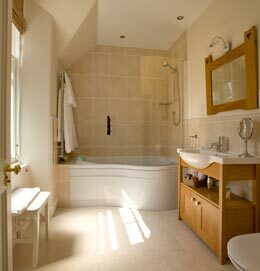 Bathroom with claw-foot bath, waterfall shower, basin and wc, en suite. The breakfast table and Dining Room. 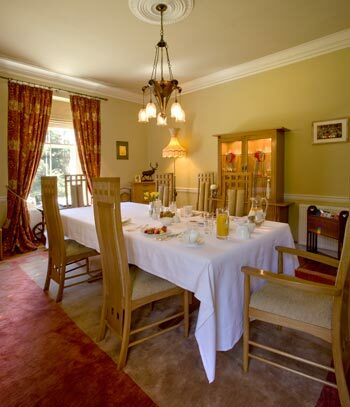 Breakfast is served in the Dining Room, again with views of the garden from the windows. Carol and Gordon have their own hens and bake their own bread and with their passion for astonishing breakfasts they have taken the art of morning sustenance to new heights! Grantown-on-Spey has a good variety af places to eat in the evening: from two fish and chips shops, and Indian restaurant to smart contemporary Scottish cuisine, all within easy walking distance. Traditional porridge with cream and heather honey. Eggs - fried, scrambled, poached, boiled. tomato, potato scone, mushrooms and haggis. Creamy scrambled eggs with Cairngorm Smokehouse smoked trout, served on a lightly toasted muffin. Blueberry pancakes with crispy bacon and maple syrup. A selection of Coffees, Teas and Herbal Teas. Home-baked wholemeal, granary or white toast. Home-made marmalade and apple and lemon curd. Vegetarian and special diets happily catered for. 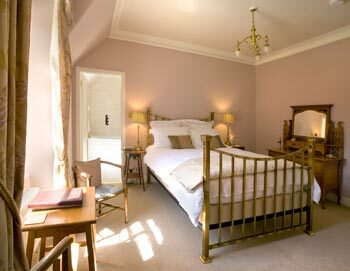 Single occupancy – £140 per room per night (including breakfast). 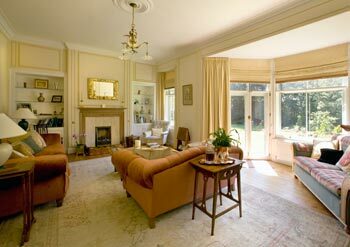 You are welcome to relax in the Drawing Room which is supremely comfortable. Also see: some photographs of the River Spey and Anagach woodland, taken by the About Scotland editor during his visit. Short film taken June 2010 of Blondie the Red Squirrel eating a monkey nut. Towards the end of the film you can see it stripping bark from an old tree and bundling it to take to its nest at the The Dulaig B&B Grantown-on-Spey (www.thedulaig.com). Please tell Carol and Gordon you found The Dulaig through About Scotland! Top two, and photograph on the right, by Carol.